Vance Bockis died on September 1, 2012. He was 51 years old. A figure in the DC music scene. 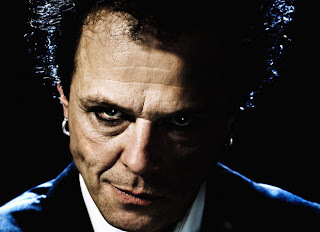 Most people will know him as the front man of The Factory. I knew him as the bass player for 9353. The official cause of death is still pending, but the belief is his recent rotator cuff surgery, coupled with factors including high blood pressure and the toll a long, serious heroin problem in his past had taken on his health (clean for more than 6 years), led to a fatal blood clot. I didn't know Vance personally. I may have introduced myself to him at one of the shows I saw. Probably not. He scared me back in those days (the whole band did), and it was hard enough for me to even get to and in the clubs, much less approach the bands. But I knew Vance through his music. 9353 was an important band to me as a kid, for what they did, what they meant, and who they inspired. -- 9353, "Evil Teen Facility Yard"
I was a new kid at a new school and as usual, trying to make friends through music. This was Langley High School, located almost literally in the CIA's backyard, in the mid-80s. One of my classmates Greg Cullen gave me a tape one day. I remember, he said "Here, you might like this stuff. It's cool." One side of the tape had "Five Minutes", by Bonzo Goes To Washington, "La Di Da Di" and "The Show" by Slick Rick, and a few other things I can't recall. 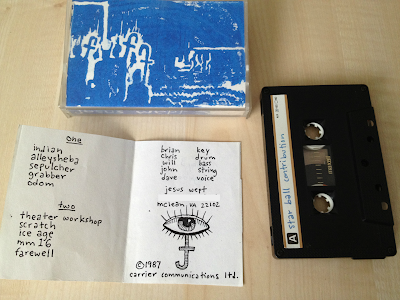 The other side of the tape had "We Are Absolutely Sure There's No God" by 9353. Front of "We Are Absolutely Sure There's No God"
The record starts easily enough with a chiming guitar part and drum beat that could have easily been on an R.E.M. album. But then suddenly the song cuts to a nervously strummed, almost funk guitar. And then the singing starts. The song is called "Spooky Room". The lyrics are simultaneously self-explanatory and mysterious. The singer seems to change voices every few words or notes. Lots of singers have slightly different voices in each register, and frequently will use different sounds for very low and very high notes. Bruce Miles Hellington, 9353's vocalist (then known as Bruce Merkle), sang like he had out-of-control multiple personality disorder. He wasn't crazy - this was obviously an artistic choice, and one executed with skill and intent. His lyrics were fantastic, simultaneously dark, depressing, and hilarious. The rest of the songs on the album were even more catchy and unsettling. Whether seemingly describing the heartless institutions like public schools or juvenile halls in "Evil Teen Facility Yard" or a damaged kid bent on revenging himself upon his entire high school graduating class in "Americana Schitzo", 9353 spoke to me in a way that was familiar and alien, serious and jokey, angry and melancholy. Apparently they spoke to Greg Cullen, too. And Christopher Davidson, John Hong, Will Gavin, Jim Chandler, Darow Han, and Howard Olsen - all students at Langley. In the 1985-1986 school year, I was a Junior. I had some classes with Christopher, John, and Darow, and through them met the other guys. I remember Christopher Davidson as a painfully shy, skinny kid who didn't seem to want to look you in the eye. But he was insightful and poetic. I remember in English class we were reading one of the classics that wasn't making an impact on me. Christopher made a comment about the atmosphere of the story and suddenly I understood the book it in a different, darker way that made it far more interesting. Darow Han was a bit more enigmatic. When he spoke, he sometimes sounded half-asleep, as though he were barely paying attention. The fact that he showed up for school one day wearing his bathrobe only added to his image of indifference. But he too was obviously much smarter than he let on. Will Gavin I knew the least-well, but he was friendly and passionate about music. We didn't share any classes, but he introduced me to lots of people and was always interested in working on art projects - videos, music, you name it. As I got to know them and some of their friends, it came out that they had a band. Or bands. It was sort of hard for me to understand the history and configurations of the various projects. I never heard The Suckies or Baby On Board, but it began to dawn on me that some combination of these guys were actually making music. Original music. As if that wasn't exciting enough, one day in early 1986 John Hong said he and some of his friends had made an album. I could buy a copy for $5. On cassette. I scrounged up the cash and was given a 60-minute Fuji tape. The cover was a photocopied photograph of a headless statue lying amongst its own ruins. The spine simply said "Jesus Wept." Inside, there was a photocopied strip of paper with song titles and another that listed recording information, credits, and the admonition to "play with dolby on and the lights off". It was one of the coolest things I had ever seen. To be honest, I didn't like it all that much. There were a few songs I thought were compelling or catchy, but much it was the sort of scattershot creative mess that one would expect from some 16 year old kids with instruments. Some jokey songs, like a piano ballad called "Nice" that sings about bunny rabbits and sunflowers and black licorice sticks before ending by reminding the listener that "the world we live in is so goddamn nice." Instrumentals. Lots of sloppy tracks ending with screaming. Some teenage pretension. I listened to it over and over, discovering a creepy unlisted monologue at the end. One piece was called "Urban Psychosis", a title taken from the Washington Post's review of 9353's "We Are Absolutely Sure There's No God". Imperfect, to be sure. But it was rather well-recorded. On a 4 track in John's basement. I'd heard some "real" records that didn't sound as good. And across its various tracks, it captured something about what it was like to be us. Maybe these kids hadn't quite got hold of something yet, but they were obviously getting close. Most importantly, it made me start to think "Maybe I could do that, too." I got to know John a bit more - we had classes in chemistry and math together. I got to see his fabled "turquoise room" recording studio, which was in fact a dark room in his basement, painted turquoise. [Per Will Gavin, John's father was an architect and "helped turn an indoor/outdoor cellar into the fabled Turquoise Room...which was a deep violet/blacklight purple color on the walls with turquoise windows and trim."]. It was a beautiful aesthetic space in which to work, clean and spare. John had a rare and precious 4-track cassette recorder. A piano and saxaphone. A delay unit. Microphones. A Korg Poly-800 synthesizer and a Roland TR-707 drum machine. I began to realize that he, and perhaps his friends, were operating at a level I hadn't even suspected existed. I realized I wanted to be a part of it somehow. 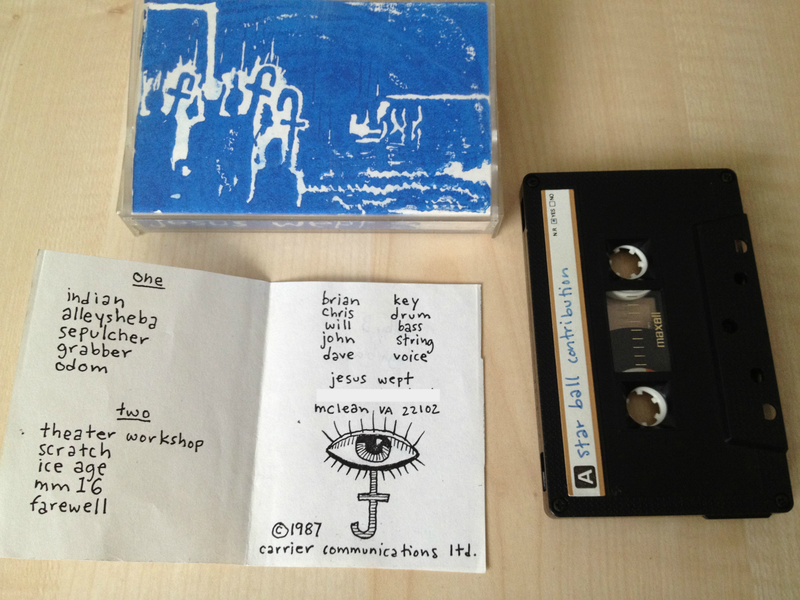 Just a few months later, they had another cassette done. They'd tightened up their line-up, with Will on electric bass, John on keyboards, Christopher singing and playing guitar, and the mysterious Erik on drums. It's a world away from the previous one. It's got live drums, for one thing. The songs are all sung by Christopher Davidson, who has a surprisingly deep voice. The guitar and keyboard sounds are great. The songs are rich, deep, and complete. The style still wanders from Joy Division-y goth rock to tracks featuring saxophone and DX21 electric piano, but it sounds like one band. There's one silly track, but it's there just to set up the final song even better. A woman's voice, on the phone, recorded from some call-in talk show. She says "real love...is imperfect, but plentiful...and if we can accept that...it is as common as the air, and just as precious." And then Christopher sings about fire escapes in flames. I couldn't believe a bunch of kids my age - who could barely drive - could make a record this good, this interesting, and this powerful. I played it over and over. One day they told me they were doing a show. Playing in someone's basement at a party. I went. The lights were off. Kids were drinking and smoking. I recognized most of them. At some point, the band set up in the middle of the basement and started to play. It was loud and sloppy. And beautiful and perfect. It was full of distortion and hurt my ears and I loved it. It was an incredibly cool experience. And after they were done, I thought "maybe I could do that". Not long after, I had a synthesizer of my own, and was slowly recording my own terrible efforts, bouncing one track back and forth between a cassette and a reel-to-reel recorder. I spent the summer between my junior and senior years working in a hair salon so I could buy a drum machine. At that fall's school talent show, I auditioned with a friend, Brian Johnston, as "The Panther Moderns". Together we covered Faith No More's "We Care A Lot". This was back before they were on a major label, before Mike Patton was their singer. Anyhow, it was my first time on stage "singing" (really, somewhere between yelling and rapping and singing) and performing. I had no idea what I was doing, but I loved it. And I knew I wanted more. Early into my senior year, Darow Han and Howard Olsen (who had previously played in a band with Will) asked me to join a band they were starting. We cycled through a few friends before settling on a line-up that has me on keyboards, Darow on drums, Howard Olsen on bass, Max Friedenberg on vocals, and Spencer Lamb (a college friend of Max's) on guitar. First known as "Friends", for some reason, eventually we settled on the name "The Bridge". We learned covers, including "With All Respect" by 9353. We wrote original songs. We hung out. We joked. We fought. We rehearsed. I stared at the clock in school, counting the hours until we would play again. We played shows together at house parties, usually when parents weren't home. Jesus Wept played in DC clubs, like DC Space. We played college parties and school dances. I never think we are as good as Jesus Wept. But eventually I appreciate that we are at least different, and perhaps OK in our own way. Meanwhile we're all swapping cassettes and listening to music and talking about bands. Joy Division and New Order. Echo and The Bunnymen. Chameleons UK. 9353. Langley High School is not a particularly nice place. It's a big, square 2 story institution, built in a kind of un-ornamented style that strives for a classic 50s modernism but only achieves grim purposefulness. It has a hollow center occupied by a seldom-used yard. Sort of like a prison, and supposedly designed by a prison architect. It is surrounded by chain-link fences and topped with concertina wire. While the administrators claim it is designed to keep "bad people" out, we're all aware the wire is pointing the wrong way. It's there to keep us in. It some ways it is just like a John Hughes movie. There really are kids who drive to school in red Ferraris. There are incredibly rich kids. My next-door neighbor was "Scooter" Libby. Many of my classmates were the sons and daughters of congressmen and senators. Some of them are under pressure to succeed in the hardest gifted and talented classes. Some are under pressure because they don't make the cut for those classes and have to deal with the consequences. Some have really strict religious parents. Some have to deal with parents in the public eye. Some have Korean parents. Most think we're all wasting our time and should be studying or working on "real" music. There's a lot of stress, self-imposed or external. We don't know it yet, but not all of us will make it through this. Still, creativity abounds. One day I note someone (probably one of my friends) has written "Evil Teen Facility Yard" on one of the doors to the seldom-used center yard. It's still there months later when the band I'm in loads our gear through it to set up for a rare show after school. Even as Darow and I are hashing through our first awkward practices and awful songs and thinking about how we could record a single, Jesus Wept pushes on. They release a 3rd cassette, with an eerie woodblock print. It's called "Starball Contribution", which I will learn is a particular kind of firework. This album is really impressive. Chris Wassell has joined on drums. His beats are interesting and his timing is rock-solid. The songs themselves finally sound like they all belong on the same album. John's switched to guitar full-time, and moves between grinding buzz-saw tones, fluid lead lines, and delicate clean parts. Brian joins the band and adds the amazing sounds of his Mirage sampler, notably the Mirage's alien, ethereal choir sounds, other acoustic instruments, and of course its ability to sample and manipulate other recordings. Will's bass playing has evolved, and effortlessly incorporates his diverse influences. I hear a lot of early Simple Minds, Joy Division, Chameleons UK, and of course, 9353. The stuff we're all listening to, and other things I've never heard. Christopher's singing is even better and his lyrics are getting weirder. The first time I hear most of these songs is a live show before the album is done, and it's amazing. John has me record the show on my reel-to-reel, and he sets up 2 microphones in what I will learn is a coincident X-Y pair. How does he know all this stuff? When the band starts, the needles on my recorder slam into red, and I dive for the controls. They're loud and powerful and tight. They sound great live, whether playing in a club or in someone's basement. I feel lucky to see them, lucky to know them. I wished my own band was this good. Jesus Wept was so great, it was almost depressing. How will I ever be this good? Why should I even try? This won't be the last time in my life this kind of...jealousy? desire? hunger? appreciation? whatever it is bites me, but this is deep, painful, and sublime. And if all of that wasn't enough, they started producing their own solo material, hinting at the directions they would later explore post-Wept. 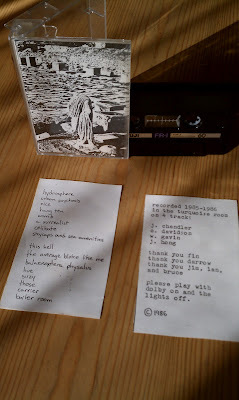 John put out 2 cassettes of instrumental music. Piano, sax, synthesizer, drum machine, guitar. Strong jazz influences. They are beautiful, shockingly so. And very different from Jesus Wept. Christopher Davidson released his own tapes (mostly solo, but one collaboration with Jim Chandler), which quickly veered away from pop songs and headed for hazy distortion, abstraction and mystery. They were fascinating, weird, terrifying, and extremely brave. Will produced his own sprawling double-album epic, which ranged from bass instrumentals to whispered stories to piano ambience and beats generated by a computer. John's 2 cassettes, "Animus" and "Resonance", expand my horizons. One kid, making music with this huge range. By himself. Unique and beautiful. I keep plugging away, working on songs, trying to borrow recording gear, reading everything I can about how to make better music. I am driving to a party. It is raining, big fat Virginia raindrops thumping onto my windshield. John's track "Dispersion" is playing, and I realize, I hear...it is ripples. Raindrops in puddles. His simple sax part, little more than 2 notes, overlaid on a few piano notes. But with the rain and the year and what's going on, I am nearly moved to tears by the time I reach the party. I sit in the car for 5 minutes with the lights off and collect myself, the music echoing in my head. None of us is even 18 yet. It is the summer of 1988. We've all been at college for a year. Most of us are back for the summer, and dealing with the conflict between our new college lives and our old high school friends and memories. Between our graduation last year and now, much has happened. 2 of our classmates are dead. Another lost her mother. Reagan's nearly done, and Bush I is on the path to election. But it's still summer in Virginia, and that time of afternoon when the sun seems to blast sideways. It's hot and moist. I'm standing outside someone's house - Will's, I think. John hands me a cassette of their new album. This one looks professionally duplicated and shrinkwrapped. The insert is on pink paper. The spine reads "Exit". I think this is apt, since we'll all be dispersing soon, this time for good. There are 7 songs. They couldn't be more different from the songs on "Starball Contribution". The structures are more elaborate. The guitar is somewhere between gothy new-wave chime and jazzy twang, and weaves intricate patterns with the bass. There are almost no keyboards on it. The presentation is understated and restrained, rather than the huge blast of "Starball". I don't like it. Not at first. It sounds great. But the songs aren't obviously catchy. No big hooky choruses. And somewhat unsurprisingly, it's a rather downbeat album. I won't listen to it much this summer. But over the next few years, as I walk across my college's freezing, raining, dark campus, profoundly alone and unhappy, this album will become sublime. In college, I will study it. I will send copies of it to friends. I will steal a melody for a song when I can't think of one of my own. I will wonder what they're all doing now. Years later, in Los Angeles, I will refer to these albums occasionally. I will steal song titles, both deliberately and inadvertently. And as the years go by and my own meager talents begin to evolve, I will appreciate these records all the more, and play them for everyone I know who likes music. Even looking back now, it's hard to believe how lucky I was to be surrounded by such talented and creative people. "...were fucked up on drugs, hating their jobs, breaking up with their girlfriends, and getting kicked out of their places to live constantly. Doing those 2 records in 3 years was kinda the smartest thing we could have [done]." 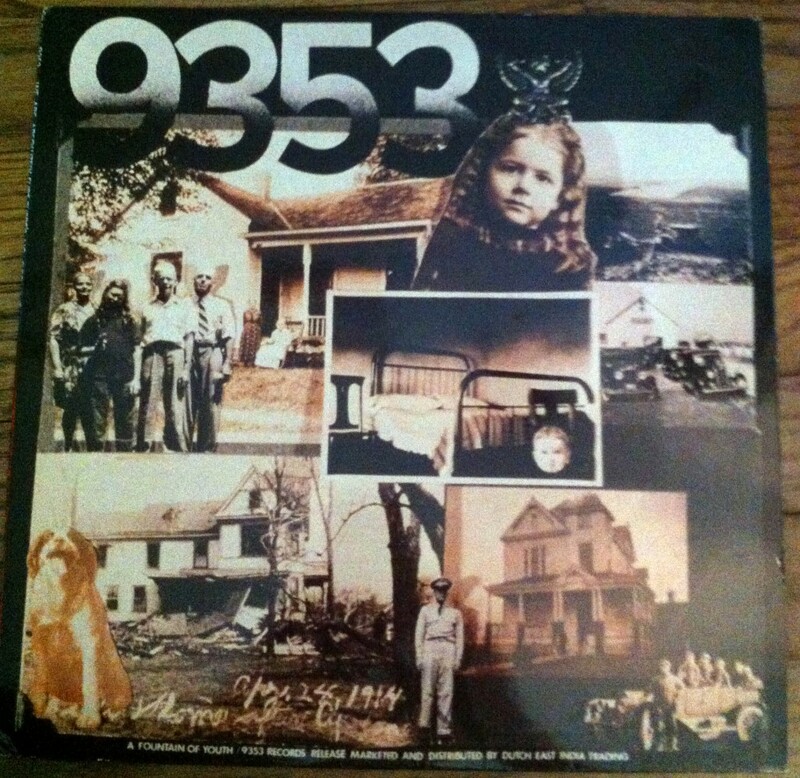 9353 made 2 records most people never heard and broke up not long after the second one came out. 2 records which cause most people to either say "I don't like it" or shrug and say "I don't get what's so important about this band." Most people know Vance Bockis for the things he did after 9353. Jesus Wept never even released what most people would consider to be a "real" record. They put out four cassettes and I only saw them play handful of shows, most in people's basements. From my perspective, they were just way ahead of their time, self-producing (in every sense) top-notch art and distributing it exactly how they wanted. I still listen to their albums regularly and marvel at them. Not just because they're "really good for a bunch of high school kids", but because I think they're really good period. But like 9353, most people have never heard or heard of them, and those that have don't care for their records. Great. They don't need to be important to "you", or "everyone". Art requires a creator and an audience, and they need to have some common areas of culture. More generic culture commonality leads to broad reach but shallow impact. Usually the more specific, unique, and weird something is, the more strongly it will resonate with a small group. I don't know if I could call the guys in Jesus Wept "friends" - much as I wanted to know them that well, it just never happened. But we walked the same halls, had the same classes, the same pressures, and lived in the same environment and era. I understood what they were saying and why. Their music resonated with me, inspired me. I knew it was special. I think most people treat the "Mona Lisa" as special because they're told it's special. Audiences looking at it today cannot see past the cloud of legend and hype that surrounds it, and without all that, it's just an old portrait. You can't just walk up to art, arms crossed, and mutter "OK, blow me away" and have an art experience. You have to be ready for it, open to it. For some people, that means having your art pre-vetted by someone. For others, it means the right things will just light you up and change you...and other things just won't. Sometimes not having your guard up is the best thing you can do. Greg Cullen hands you a tape and says "here, you might like this stuff, it's cool". You go to a basement party and your friends unleash something. You hear a song playing while it's raining. You're not expecting anything, and suddenly everything is different. "In the end, you become impressed with a lot of people no one notices and unimpressed with a lot of people everyone notices." 9353 was important to a small audience, and that audience was important to me. None of us would have done what we did, or be who we are, had it not been for that connection. The same could be said for Wept. Or for my own efforts. It's not for everyone, in all senses of that phrase. They wrote some songs. We wrote some songs. Some of us are still writing songs. Maybe those songs will be heard by some other kids, and maybe they'll decide to write some songs for other kids. It doesn't matter how many people hear what you have to say, as long as you enjoy saying it or feel better or worse or satisfied or something for having said it. And if the right people hear you, if they are truly listening, you can change their lives forever. Thank you for the music, Vance Bockis. And Jason and Dan and Bruce. And Will and John and Christopher and Brian and Chris. And Darow and Max and Howard and Spencer. And all of you reading this. 9353's physical albums are somewhat hard to find, and are not currently available in digital form through legitimate sources. The music of Wept and John Hong is available at Amazon. Bruce Merkle legally changed his name to Bruce Miles Hellington 7 years ago. He continues to create music and art, and was working on new 9353 music before Vance's death. (Vance's parts are all recorded). Jason Carmer of 9353 went on to be a successful producer and recording engineer. Dan Joseph of 9353 became a composer. His website and biography make no mention of his time in 9353. Christopher Davidson lives in Oakland, California, less than an hour from me. After Wept, he played in a few more bands, including 45/102 with Will Gavin and Steve Smith, and "Citizen Band" with Greg Lenczycki and Thomas Day. Today, he is a respected mastering engineer, and has continued to make abstract, largely electronic instrumental music, including 4 CDs as "antimatter" and 3 collaborations with Tokyo composer Zbigniew Karkowski. Though I've lived in San Francisco for 12 years, we have yet to meet up. John Hong is a professional architect of some note. Some years ago he told me he has notebooks filled with compositions. He has been recording with Will recently. Will Gavin wrote this about Vance Bockis. Will runs XARRIER INFRASTARWERX RECORDINGZ with John, which has remastered and re-released all of the albums mentioned here, plus many of his newer compositions. Will has been a musician non-stop since high school, and continues to write and record today. Darow Han and I keep missing each other. He lived in San Francisco when I lived in L.A., and now that I'm in San Francisco, he's in L.A. Post-college, Darow had a career as a rapper and released a punk rock record. He works in technology. I don't think he plays music anymore. Howard Olsen is married and has a child. He is a lawyer and lives a few miles south of San Francisco. We had dinner a few years ago. Howard released an album as The Under Ground in 2002. He was writing songs and playing guitar last I checked, though it's likely parenting duties have curtailed that somewhat. Max Friedenberg lives in Santa Fe, New Mexico, where he runs Master Switch recording. He is married. Brian Johnston lives in Frederick, Maryland. He is married and has children. Chris Wassell lives in San Diego, California. He recently had a child. He spends his artistic time painting. But who knows for how far? How can you determine what kind of people we grow up to be? While my memory of the band's music remains sharp, after 25 years, my memory around some facts is a bit blurrier. Additionally, there were many details of which I was not aware. Vance Bockis was 51 at the time of his death. He had completed all the bass parts for a new 9353 album with Bruce. Many people close to Vance wish to emphasize that he had been free from his heroin addiction for more than 6 years, and that medical professionals dispute whether or not his long addiction was a factor in his death. 9353 broke up after their second album was released, not before. Vance Bockis' father was an architect, just like John Hong's father. Christopher Davidson took the statue photograph on the cover of the first record, and it is his handwriting on the spine. There was an alternative cover with a different photo. "Rudenotse Wake II" was recorded in John Hong's garage, with vocals and mixing done inside the Turquoise Room. There are actually 3 different versions of "Rudenotse Wake II", and 2 different covers. Will Gavin says the band kept releasing new versions to reflect the live set. "...As it progressed and songs evolved, we would remaster the album" until the next one was ready. John Hong took the cathedral photograph used for one of the "Rudenotse" covers. Chris Wassell made the woodblock print on the cover of "Starball Contribution", and it is his handwriting that appears on the inside liner notes. Christopher Davidson took the photograph on the cover of "Exit", and it is Will's handwriting on the spine. Will Gavin clarifies that "Exit" was hand-wrapped by the band using shrinkwrap and a hair dryer, and was not mass-duplicated - but they worked to make it look as polished as possible. While many kids at Langley (myself included) came from wealthy families, Will Gavin notes that Jesus wept worked "...at gas stations, grocery stores, shoveling snow, and mowing lawns" to pay for their instruments. Will notes that "none of our parents were poor nor rich...I can only recall 1 [band member] going on a vacation with their folks." I mostly saw Jesus Wept in basements. 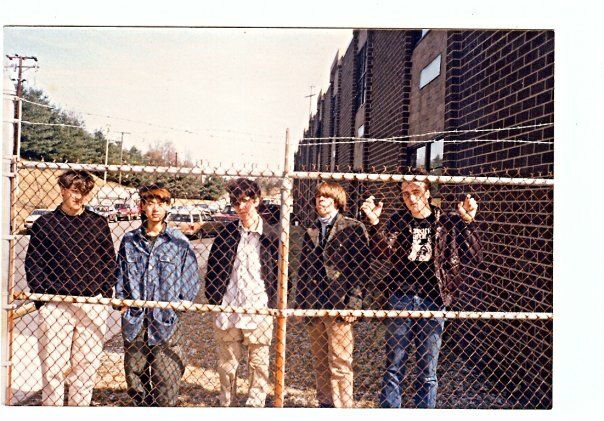 Will notes that Jesus Wept "did play most major venues in DC at the time (Kazz, Asmara, Safari, DC Space, but notably not the 9:30 club), as well as several in Richmond...the largest...was a gig opening for Psychic TV in front of about 300 people." That was also their last club show, and afterwards only played 2 more shows, concluding with the "Carrier Communication world debut art show at the Henry Street Gallery". "Exit" was actually released in 1988, not 1987, which means it came out the summer after our freshman years in college. The post has been updated to reflect this.